Congratulations — Retired or retread! CASE would like to extend a very special THANK YOU to all those administrators who are retiring this year! I know you have all spent many extra hours doing a job half the people think isn't needed and the other half think you don't do enough! I have often compared it to walking very carefully on the edge of a razor blade! But you have now reached a point where you are leaving this job and I hope you feel you have truly made a difference! We hope you will remain a member of CEC and CASE at our special retired member rate! We know from experience that many of our members may retire but they often are "retread" and begin a new, related series of jobs. Sometimes it is consulting, sometimes it is a part-time position, and sometimes it is an interim position. The bottom line is you have some amazing experience and wisdom and you most likely will be approached to "help out" some along the way. I think this is a great thing — the field doesn't lose your experience and wisdom and you get to try something new and different and maybe a little less stressful! A really great example of this "retreading," is former CASE president and current past president of CEC, Dr. Christy Chambers. Christy sent me a link this week to a video she narrated for SpED Talk on identifying students for accommodations. This video is informative and I am planning on using it with an Assessment class I teach for Piedmont College. Many of you know that Dr. Chambers has been very busy in her retirement and is constantly learning and doing. My hope for all of this year's class of retirees is you will take a few weeks/months to breathe in and breathe out and then find your new "niche" for the next few years ... whether it is with grandkids, staying in the special education/education field, or trying something totally different. No matter what you do now and later, Thank You for your service! Speaking of service, we need your help as we head up to the Hill in July! 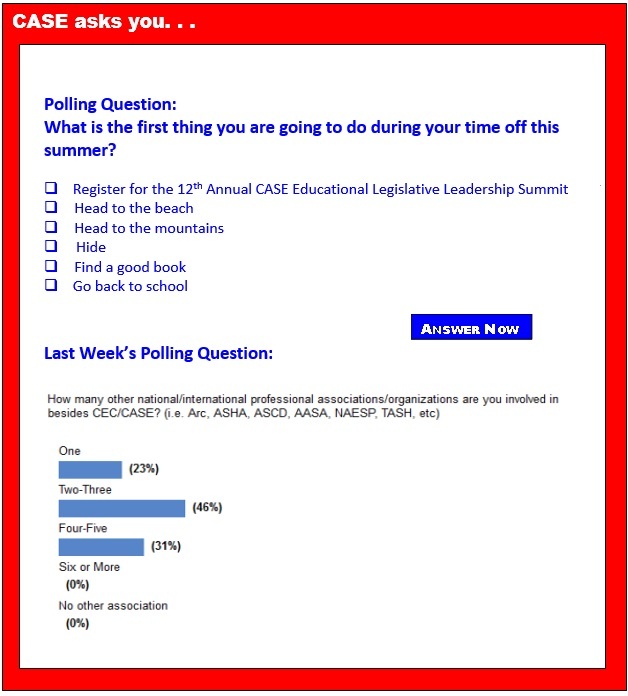 The CASE Educational Legislative Leadership Summit, July 13-16 is a great opportunity for you to provide a great service to the field! We need every state to have a team attending the 12th Annual CASE Educational Legislative Leadership Summit, July 13-16, 2014. Go to the CASE website to register and click here for the flyer. This year as every year, it is very important for CASE to have as many different states represented up on the Hill for our visit on Tuesday, July 15. There are several really important national issues we will be working on in DC this year with our other association partners. Don't miss this great opportunity. And, with a hotel group rate of $149 at the Hilton Old Town, right across from the King Street Metro stop, this might be a great time to do a DC excursion for you and the family! Group rate ends June 17 so click here to make your hotel reservations! Click here to download a flyer. •	Save $151.00 when you register by June 2! Sometimes a new idea seems so obvious that we slap our foreheads and wonder what we were thinking all along. In the early 19th century, the German educator Friedrich Froebel came up with the idea that young children should be encouraged in what they naturally want to do: play. The time is almost here to advocate, advance, and transform at the CEC National Legislative Conference, held June 7-10 in Arlington, Virginia. At CEC's National Legislative Conference, we'll train you to become an activist and work alongside our advocacy team on the issues that affect your students and your profession. A student who feels belittled and ostracized by school peers might struggle to perform academically and come to dread school. In extreme cases, bullying can cause such anguish that students suffer depression or harm themselves or others. Tragic outcomes related to bullying are too familiar, especially in the Internet age when online taunts or sexually explicit bullying go viral. Field testing for the Common Core assessments wrapped up in June, with districts in 36 states reporting mostly successful first runs despite some challenges around technology, test questions and scheduling. Some four million students in the Smarter Balanced Assessment Consortium and the Partnership for Assessment of Readiness for College and Careers participated in the trial run. Most field tests last 2.5 to 4.5 hours, depending on subject and grade level. The actual tests will take between 7.5 and 10 hours, spread out over two weeks. Among the many challenges faced by children with dyslexia (and by their parents and teachers) is the nagging fear that their difficulties with reading are entirely hard-wired: predetermined by their genes and impossible to change. Recent research offers a balm for that fear. It suggests that experience plays a big role in dyslexia, both in exacerbating reading problems and, potentially, in easing them. Dyslexia is the most common learning disability in the United States, affecting more than 10 percent of the population. Its cause has remained a mystery, however, and over the years scientists have advanced many theories about the biological mechanism leading to dyslexic people's struggles with reading. Charter schools must provide special education services and ensure that students with disabilities are not discriminated against just like traditional public schools, federal education officials say. In a "Dear Colleague" letter, the U.S. Department of Education said that charters have the same obligations as regular public schools to comply with the Americans with Disabilities Act and Section 504 of the Rehabilitation Act in addition to other federal civil rights laws. Such responsibilities are the same whether or not charters receive federal funding, the Education Department guidance indicates. Should schools expect students with a disability to know the same things as other kids their age to advance and graduate? This decades-old question, which strikes at the heart of the civil rights movement for students who have disabilities, has provoked a debate in Louisiana that's dividing advocates. Legislation unanimously approved by the Louisiana House now being considered by the Senate potentially would lower expectations for students with disabilities by allowing teachers and administrators to promote or graduate them without regard for state standards, according to several national advocacy groups and Louisiana's schools chief. A new study of preschools and day care centers finds that flame retardants are prevalent indoors, potentially exposing young children to chemicals known to be hazardous. The study, to appear online Thursday, May 15, in the journal Chemosphere, was led by researchers at the University of California, Berkeley, and funded by the California Air Resources Board. Although many infants and young children spend up to 50 hours per week in day care, the study authors noted that this paper represents the first systematic review of flame retardants in early child care settings. Sometimes a new idea seems so obvious that we slap our foreheads and wonder what we were thinking all along. In the early 19th century, the German educator Friedrich Froebel came up with the idea that young children should be encouraged in what they naturally want to do: play. Teachers could help them along through games and other forms of loosely structured education, bearing in mind that each child learns at a different pace. The charming word he gave to his concept is now used worldwide: kindergarten. Although American children still spend part of their days reading, they are spending less time doing it for pleasure than decades ago, with significant gaps in proficiency, according to a report. The San Francisco-based nonprofit Common Sense Media, which focuses on the effects of media and technology on children, published the report, which brings together information from several national studies and databases. Learning is more effective if a lesson or experience is deliberately coupled with time spent thinking about what was just presented, a new study shows. A team of researchers from HEC Paris, Harvard Business School, and the University of North Carolina conducted what they call the first empirical test of the effect of reflection on learning. By "reflection," they mean taking time after a lesson to synthesize, abstract or articulate the important points.